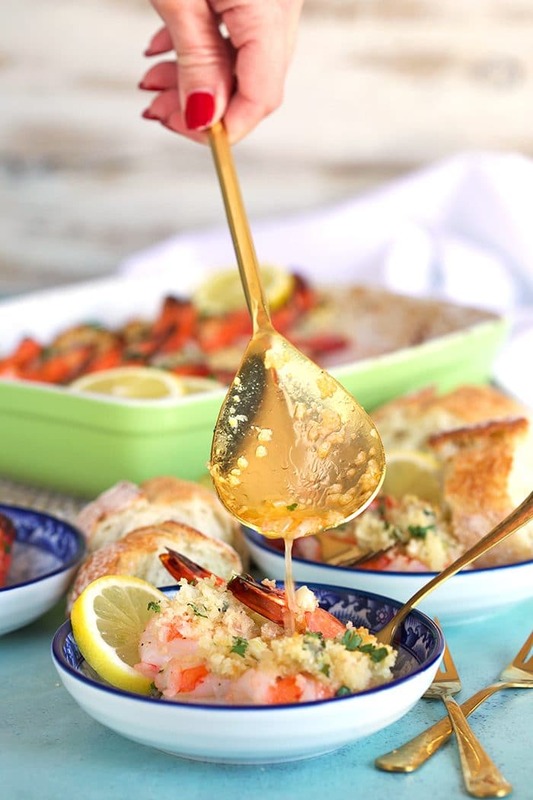 Easy weeknight dinner or fancy pants dinner party, this easy Baked Shrimp Scampi recipe comes together quickly and simply. 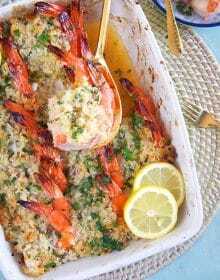 Jumbo shrimp baked in a garlicy, white wine sauce with a hint of lemon and topped with a crispy, buttery, crunchy crust. It’s a new family favorite for sure! I think everyone might feel the same since we’ve been holed up indoors for months….and even if you’re an outdoorsy person all year long….don’t you want to sit outside without fifteen layers on? Me too. Having friends around when the weather starts to give you peeks of summer just makes the days that much sweeter, anticipatory in a sense for what the season has in store the next few months. I start to crave all the seafood dishes like this Baked Shrimp Scampi recipe….because they’re light and briney and taste like summer. Shrimp Scampi is one of my favorite things to cook because it’s so easy to whip up with minimal ingredients but still has tons of flavor from the garlic, butter and wine….all punched up with a bit of lemon juice and maybe some shavings of parmesan to round everything out. 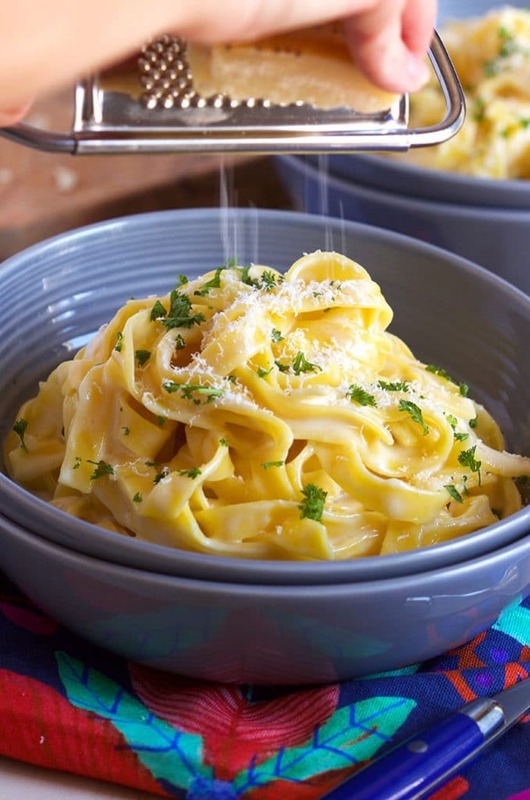 It’s just about as perfect as a dinner can get….with or without the linguine. 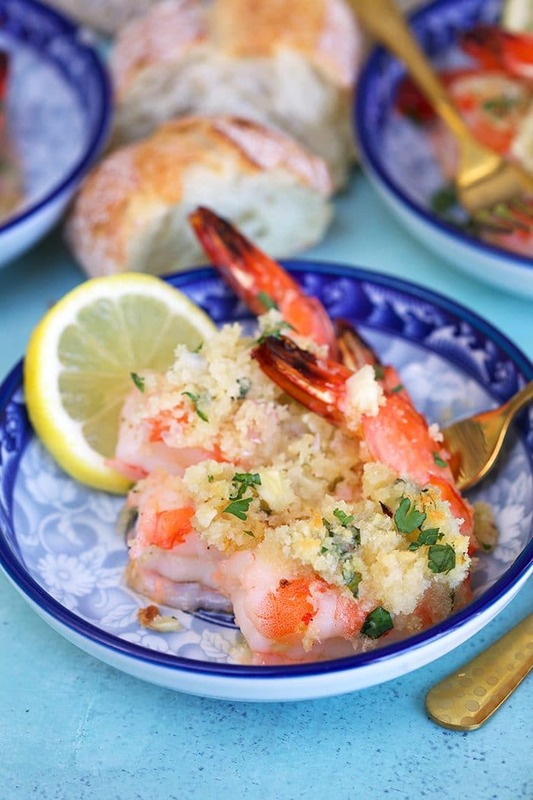 This Baked Shrimp Scampi is equally easy to make with a crusty panko topping that makes it just incredibly amazing to dig into. In my opinion, this is the best shrimp scampi recipe around and it comes together in just minutes of hands on time. Crispy Baked Shrimp Scampi is a great dish for dinner parties because you can prep it ahead and bake it right before serving. 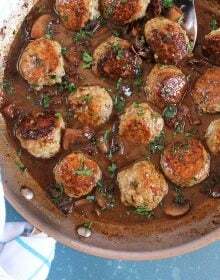 Plus, you can easily double or triple the recipe to accommodate your growing guest list. Classic Shrimp Scampi is a simple saute of jumbo prawns in a white wine, butter, garlic sauce that’s usually served over linguine, angel hair pasta or with crusty bread for dipping. We also like to serve shrimp scampi with rice! So, sooooo good! 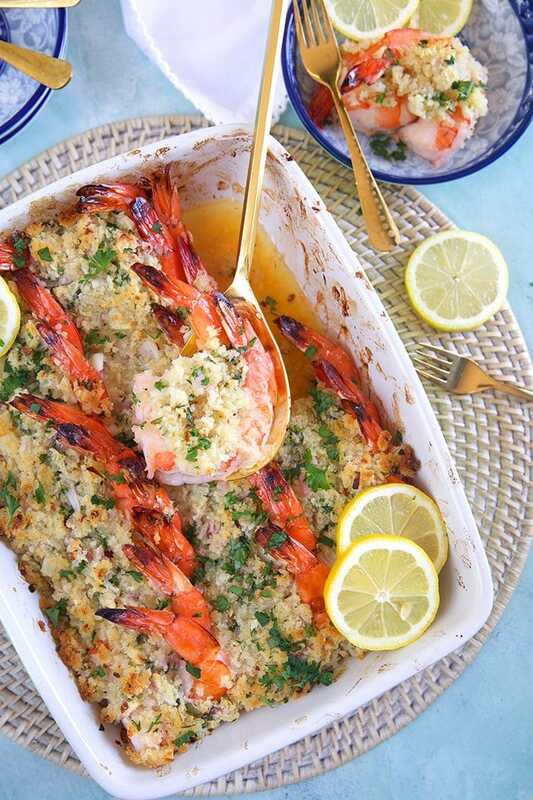 In this Baked Shrimp Scampi recipe, the white wine, butter, garlic sauce is used to roast the shrimp in a baking dish that’s been topped with a crunchy panko bread crumb topping. 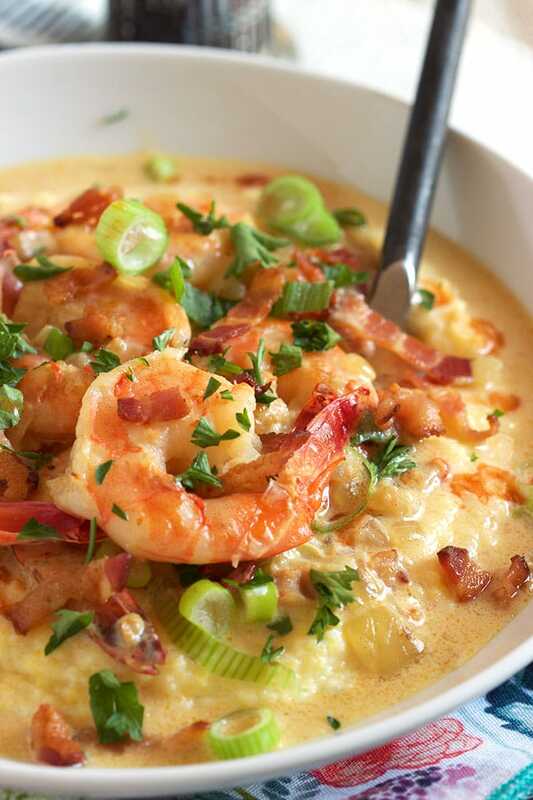 It’s kind of like a Baked Shrimp Casserole…..sorta. And it’s really simple to make. 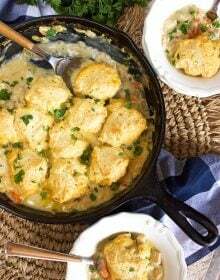 There are really so many things you can serve with this baked Shrimp Scampi casserole…..or just serve it all by itself for an easy appetizer! Easy Spaghetti Aglio e Olio is my personal favorite! 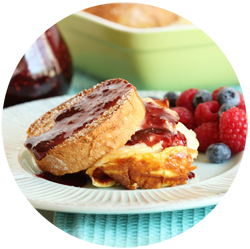 Or with simple Popovers for dipping! There really are no rules when you serve this Baked Shrimp Scampi recipe, a simple green salad with homemade blue cheese is a great addition, too. 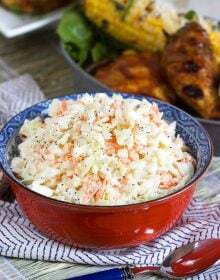 Or try this easy Wedge Salad to make your dinner party look like you slaved for days…..but spent like a whole hour pulling dinner together. That’s usually how I roll, there’s no reason you need to break a sweat when you’re entertaining friends….the whole point of entertaining your friends is to enjoy yourself as much as your guests. So, my advice…keep things simple and serve dinners that don’t take all day to prepare. We love this garlic Shrimp Scampi on weeknights, too. Sometimes I’ll throw everything together in the morning….minus the breadcrumb topping and store it in the refrigerator until dinner time. Top the shrimp casserole with the buttery breadcrumbs right before you pop it in the oven and serve it as soon as it’s done. Kids love it, friends love it, moms love it….and you only have one pan to clean. 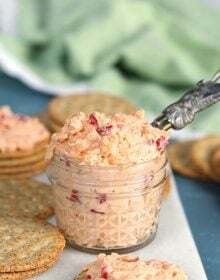 If you’re looking for even more easy shrimp recipes, be sure to check out THESE READER FAVORITES! 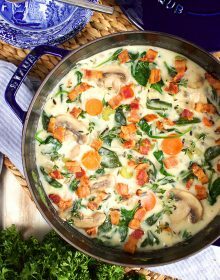 There’s really no shortage of shrimp recipes that you can get on the table in a flash and all of those are a big hit with everyone in my family. 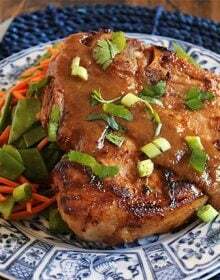 Want to see even more easy recipes and family dinner inspiration? Follow us over on Instagram! 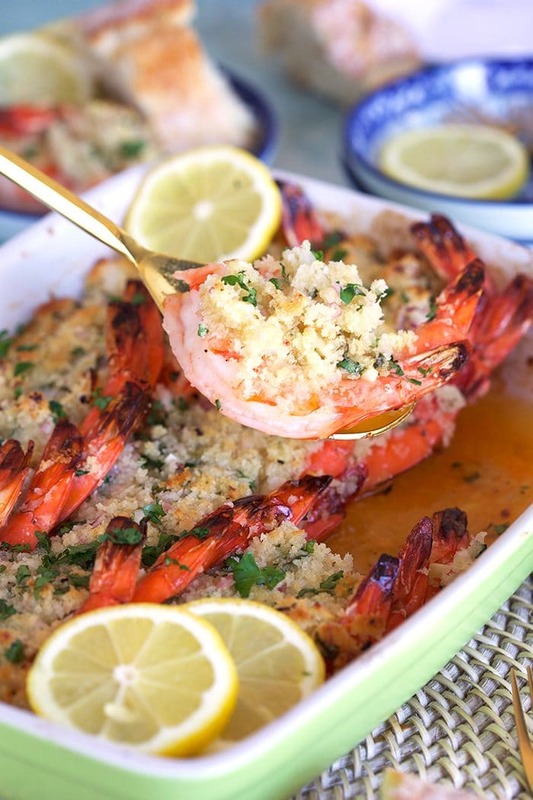 Super simple to make Baked Shrimp Scampi recipe is made with jumbo prawns and baked with a white wine garlic sauce then topped with a crunchy breadcrumb topping. Add the shrimp to a mixing bowl and toss with the olive oil, wine, 1 tsp kosher salt and 1/2 tsp pepper. Allow to stand for 10 minutes. 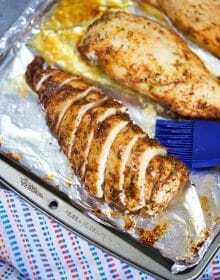 In a separate bowl, combine the butter, garlic, shallot, parsley, cheese, basil, red pepper, lemon zest, lemon juice, bread crumbs, salt and pepper. Set aside. Coat a 9x13 inch baking dish with cooking spray and arrange the shrimp in a single layer in the bottom of the dish with the tails pointing up. Pour the remaining marinade over the shrimp and then spread the breadcrumb mixture evenly over the top of the shrimp. 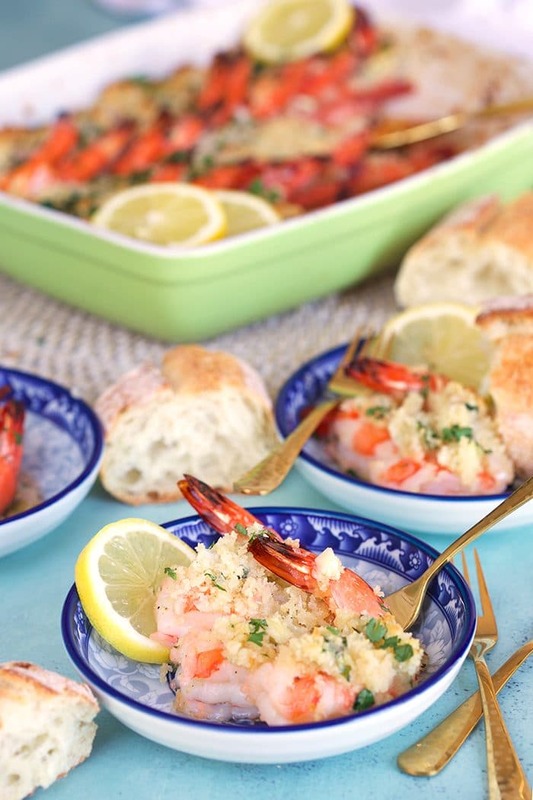 Bake the shrimp scampi for 10-15 minutes or until bubbly and golden brown. If you'd like the top even more golden, place under the broiler for 1 minute. 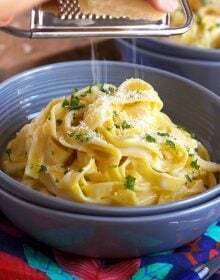 Serve with extra grated parmesan cheese, lemon wedges and chopped basil, if desired. This recipe sounds delish. Is there really 16 T (1 cup) of butter used? Yep! But you’re not drinking it, most of it ends up in the bottom of the dish. Oh my gosh this turned out so wonderful. And it’s so easy too! Shrimp is so yummy and this dish was no exception! YUM! 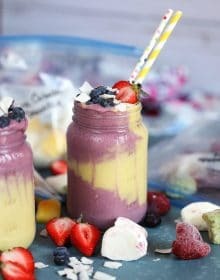 Wow, this recipe looks amazing! I think it would knock the socks off of my family! Can’t wait to try it. My husband was dying for me to make something with shrimp in it so I made this and we both devoured it! So delicious.